The Faces of Mentoring explores the meaningful relationships formed between mentors and mentees. 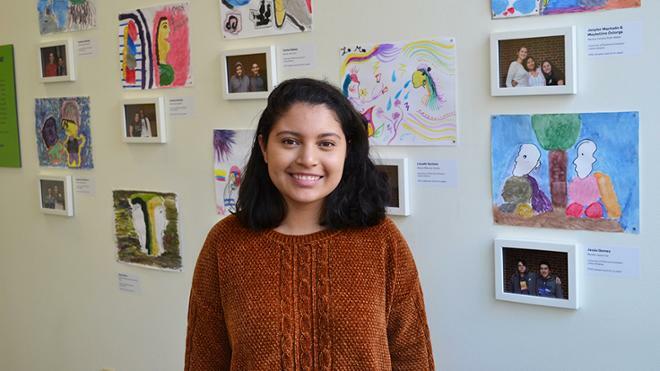 Curated by Benites, a Bonner Scholar who has interned with Virginia Mentoring Partnership since her first year at the University, the exhibition is an open invitation to the community to learn more about mentoring programs in Richmond. Benites, as well UR students Casey Murano, a sophomore, and Suraya Souidi, a first-year, facilitated art workshops where participants created blind contour drawings. Artists trace the contours of their subject’s face without lifting their pen or looking at their paper. Mentors and mentees then reinterpreted these lines and transformed them into expressions of their mentoring relationship. The art created during the workshops, portraits of the participants, and statistics about mentoring, will be on display. A special RVA First Fridays opening celebration will be held April 5, 5-7 p.m. with a gallery talk taking place at 5:30 p.m. The Faces of Mentoring will run through August 23 and is supported by Virginia Mentoring Partnership, University of Richmond Scholars’ Latino Initiative, Higher Achievement, Ladies of Focus, Youth Life Foundation of Richmond, and University of Richmond Bonner Center for Civic Engagement. UR Downtown’s Wilton Companies Gallery, located at 626 E. Broad St., is open Monday through Friday from 8:30 a.m. to 5 p.m.